Ode to the almighty artichoke, a delicious edible plant from the thistle group of the Sunflower family. The artichoke has been a veggie of magic and allure for centuries. Ancient folklore suggests that a beautiful woman angered the gods and so she was turned into a thistle (leaves with prickles) as a result. In Rome, only men were allowed to eat artichokes because they were thought to increase their libidos. In Greece, the artichoke was attributed to being effective in securing the childbirth of boys. Aside from the ancient beliefs, artichokes are nutritious, low in calories and fat free too. The delicate, clean flavor of the artichoke leaves your mouth kissably fresh. 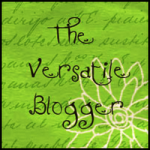 They are versatile and can be prepared numerous ways. Artichokes are added to dips, salads, pastas, pizzas, soups, burgers, and whipped up in just about any manner imaginable. When poached, the artichoke is something to be savored. It’s petals can be pulled one by one and dipped into a lip smacking lemon butter sauce. 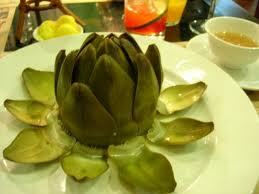 Once the petals are all consumed, you have finally reached the tender heart of the artichoke, the juiciest part! In a large, deep skillet, combine the water with the juice of 2 of the lemons; add the 4 lemons to the water in the skillet. Working with 1 baby artichoke at a time, snap off all of the dark green outer leaves. Using a sharp knife, slice off the top half of the leaves and peel and trim the stem. Drop the baby artichokes into the lemon-infused water. Add the 1 cup of olive oil and the white wine, onion, coriander seeds, peppercorns, thyme, rosemary, sage and bay leaves to the skillet. Bring to a simmer over moderately high heat, then reduce the heat to low. Cover and simmer until the artichokes are tender when pierced with a fork, about 20 minutes. Let the artichokes cool in the cooking liquid for 30 minutes. Transfer the artichokes to a work surface; discard the cooking liquid. Cut the artichokes in half lengthwise and arrange them on a platter. Drizzle the artichokes with a little olive oil, sprinkle with salt and serve warm or at room temperature. The poached baby artichokes can be drained and refrigerated overnight. Let the artichokes return to room temperature before serving.